How long ago exactly did I hear about Korean tacos anyways? I heard about the uber-successful and much-loved L.A. Kogi trucks it seems forever ago. Actually, I used to subscribe to KCRW Good Food podcast and it was a January 24, 2009 edition. 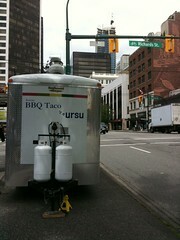 But hey, at least the Vancouver food cart program was a success; I feel bad about the Toronto food cart program’s woes. I didn’t have my Street Food iPhone app on, so only managed to run into the understated taco truck parked at Richards and West Georgia. It was the first food truck I would see before entering the very core of downtown and was I glad to get to try it! Two older Korean women manned the truck and let me “customize” my two tacos: choice of three fillings (tofu, chicken, bulgogi beef) with soft/hard taco shell, and with mild or spicy sauce. Yup, I can only weigh in on tacos for that’s all I ordered, but I like to think I maximized my experience. The order was a little slow to come out, and I was the only customer at 1 p.m. on a brilliant Friday afternoon. I ate the tofu soft taco first where she had applied mild sauce and loved it. The soft taco shell tasted fresh and was a little chewy. The mild sauce has black pepper kick to elevated the crumbled stir-fried firm tofu well. Then I was onto the hard taco shell spicy chicken and it was unabashedly spicy with pungent chili sauce. I suffered a little eating it! At $2.99 per taco, it’s not too bad pricing. I would agree that you get more filling in a soft shell taco–but I love a hard taco crunch!–so next time I would go back for the tofu-mild-soft and a bulgogi beef-hard. 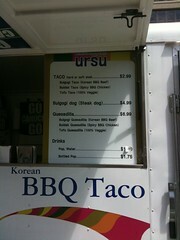 Seems like the latter is the quintessential, original Korean-meets-taco creation anyways.